Since we have started building our own bass guitar pickups in the late 2003, we never stopped our research in order to achieve increasingly better sound and performance. 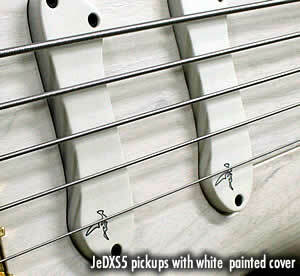 Our neodymium pickups, called the JeDXS, not only boosts its own performance but also introduces a new feature... a totally new shape. Almost three years have passed since we started our research in order to develop our own pickup design. Producing our own pickups was very challenging, but we were sure that it would offer us a lot of advantages, like the perfect possibility to fine tune our own sound, better matching to onboard electronics to get maximum performance, and flexibility to offer more options for our customers. It involved rather long and of course expensive research. Since then we have made dozens of preliminary projects and prototypes, changing many parameters and design details. Our new JeDXS is the latest (but not the last) project in that long journey. Powered by the latest generation of Neodymium magnets and a split coil feature, it brings powerful gain with a wide dynamic range inside of a hum-free, compact* design. And here is our final touch, the new organic shape matching our overall design philosophy and the engraved "Bird" logo. Our "Bird" logo was first introduced on our Legend bass as an unconventional F-shaped sound hole. 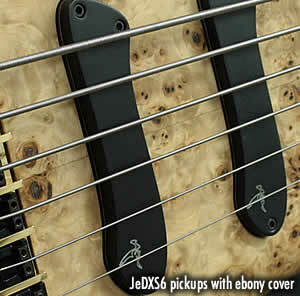 Our new JeDXS pickups are available on our entire line of Obsession and Oracle series. Barcelona Series uses the same core pickups but with different wood cover. 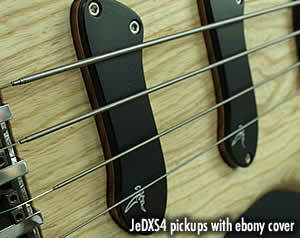 Barcelona neck pickup is JeDXD type (JeD4XD, JeD5XD etc.. depending on string number) and Barcelona bridge pickup is JeDXS-BCN which is a thinline version of JeDXS bass guitar pickup. 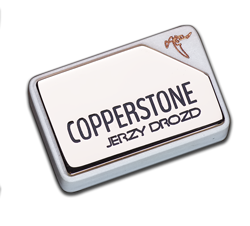 All Jerzy Drozd JeDXS and JeDDX pickups except JeDXS-BCN have three point attachemt design which allow for perfect adjustment of heigh cross all strings and pickup angle. We use stainless steel screws with brass inserts for precise adjustments and long life durability.